I want to be an entrepreneur but don’t think I have a good idea. What should I do? Gregg Fairbrothers: If you can get things done and are willing to work with resources you don’t control, you don’t need an idea. Lots of people have ideas, but aren’t willing or able to do the work it takes to turn them into value. If you are asking this question and have execution skills developed from past business experience, you have the most valuable assets every person with an idea needs. Ideas are everywhere, as are the people who have them, and most of those people don’t have the experience to execute. Many of them can’t drop what they are doing to pursue their idea full time, and many can’t take the risks. Shop around, look at lots of ideas until you find the right team and idea for you, and then team up. How to learn? Learning is 5% hearing, 10% seeing, 85% doing . (Aristotle said something like that.) The hearing includes what people tell you, what you read (including all the courses you can take, degrees you can get, books, magazines, streaming videos, and yes, all the blogs and websites). Seeing means finding successful people and imitating them; get yourself good mentors and, ideally, get into a successful startup with quality people. Soak up who they are, how they think, what they do. The remaining 85% is getting going and doing: trying things, being willing to make mistakes and learn from them. Howard Stevenson at Harvard is fond of saying that entrepreneurship is the relentless pursuit of opportunity without regard to the resources controlled. That skill is a lot more valuable than an idea. Find one and apply the skill. Leverage your network for ideas: I started as someone who wanted to be an entrepreneur but didn’t have a good idea. 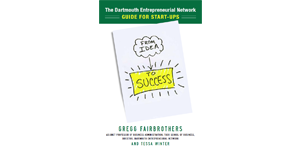 In my case, I was able to utilize the help of the Dartmouth Entrepreneurial Network to connect me with people in the Dartmouth community that had business ideas and/or interesting technology that were looking for help. While I chose to look for ideas within a university community, you can also leverage friends, family, and your industry contacts. Whatever approach you take, networking is the key. Move to where the action is: There are three cities that are hubs of entrepreneurial activity – San Francisco, Boston, New York. If your number one goal in life is to be an entrepreneur and you have flexibility and a sense of adventure, you might want to consider moving to one of these cities to immerse yourself in start-up culture and find a start-up company you can join. Your entrepreneurial learning curve in a place like San Francisco will be tremendous. Build expertise in an industry: One approach is to get a job in an industry that interests you. While you’re getting paid to do your job, you can build your knowledge of the industry, develop your network within the industry, and look for problems to be solved. The key to this strategy is picking a healthy industry with strong fundamentals/growth prospects and knowing when to make the jump to starting a venture. Practice, practice, practice: No matter what approach you take, you can develop your ability to spot opportunities through practice. Think about inefficiencies or problems you face in your every day life, how you might solve them, how many other people might pay for that solution, and how you would build a business around delivering that solution. Consider building an e-ship group with a few friends where you meet monthly and present your ideas for feedback. Test your ideas with real customers and keep iterating until your concept begins generating excitement. And above all, listen and ask questions. That is the best way to both find ideas and test your ideas. ← What skills do I need to learn to get started?